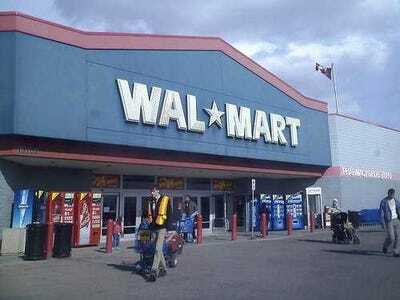 UPDATE: Wal-Mart’s Q4 2012 earnings release is out.Earnings per share came in at $1.67, higher than estimates of $1.57. Revenues came in at $127.1 billion, a bit less than expected. Wal-Mart offered guidance for first-quarter earnings in a range of $1.11 to $1.16 per share, lower than analysts’ consensus estimate of $1.19. The company also hiked its 2014 full-year dividend 18 per cent. While leaked emails circulated among Wal-Mart executives describing February sales figures as a “total disaster” blamed payroll tax hikes as the main culprit, the company today said the slow start was largely due to delayed tax refunds. The stock is moving higher in pre-market trading. Wal-Mart Stores, Inc. (Walmart) reported fiscal year 2013 fourth quarter diluted earnings per share from continuing operations (EPS) of $1.67, a 10.6 per cent increase compared to last year. Full year EPS were $5.02, also a 10.6 per cent increase over last year. The company’s quarter and full year performance benefited from a lower than expected effective tax rate. Last year’s fourth quarter EPS were $1.51. Walmart U.S. added more than $10 billion in net sales during fiscal year 2013, including approximately $4.7 billion in comp sales. For the fourth quarter, Walmart U.S. reported a 1.0 per cent comp sales increase. Walmart U.S. gained market share1 in “food, consumables, health & wellness/OTC,” as well as the entertainment categories and toys. Walmart International grew net sales 7.4 per cent to $135.2 billion for the year. On a constant currency basis2, net sales would have increased 7.8 per cent to $135.7 billion. Consolidated net sales reached $466.1 billion for the year, an increase of more than $22 billion, or growth of 5.0 per cent. Consolidated operating income was $27.8 billion for the full year, an increase of 4.7 per cent over last year. Walmart reported strong free cash flow2 of $12.7 billion for the 12 months ended Jan. 31, 2013, an 18.1 per cent increase over last year. Return on investment2 (ROI) for fiscal year ended Jan. 31, 2013 was 18.2 per cent. During the 13-week period, the Walmart U.S. comp was driven by an increase in average ticket of 1.1 per cent, and a traffic decline of 10 basis points. According to the Nielsen Company, we gained 40 basis points of market share1 in the measured category of “food, consumables and health & wellness/OTC” during the 13 weeks ended Jan. 26, 2013. And, according to The NPD Group for the three-month period ending Dec. 31, 2012, we also improved market share1 in toys and the Walmart entertainment categories. The Walmart U.S. 13-week comp for last year’s first quarter 13-week period rose 2.6 per cent. The Sam’s Club 13-week comp, excluding fuel, benefited from a 1.6 per cent increase in traffic and a 0.7 per cent increase in average ticket. Last year, Sam’s Club comp, without fuel, for the first quarter comparable 13-week period rose 5.3 per cent. Walmart U.S. and Sam’s Club will report comparable sales for the 13-week period ending Apr. 26 on May 16 when the company reports first quarter results. For fiscal year 2014, Walmart will report comparable store sales on a 53-week basis, with 4-5-5 reporting for the fourth quarter. Walmart’s comp reporting first week starts with Sat., Jan. 26, 2013. ORIGINAL: Heads up: we are just minutes away from Wal-Mart’s fourth-quarter earnings release, due out at 7 AM ET. Analysts expect the company to post earnings of $1.57 per share and $128.5 billion in sales. Shares of the global retailing giant are down 3.2 per cent since Friday, when leaked emails circulating among executives characterised February sales figures as a “total disaster,” off to the worst monthly start in at least 7 years.